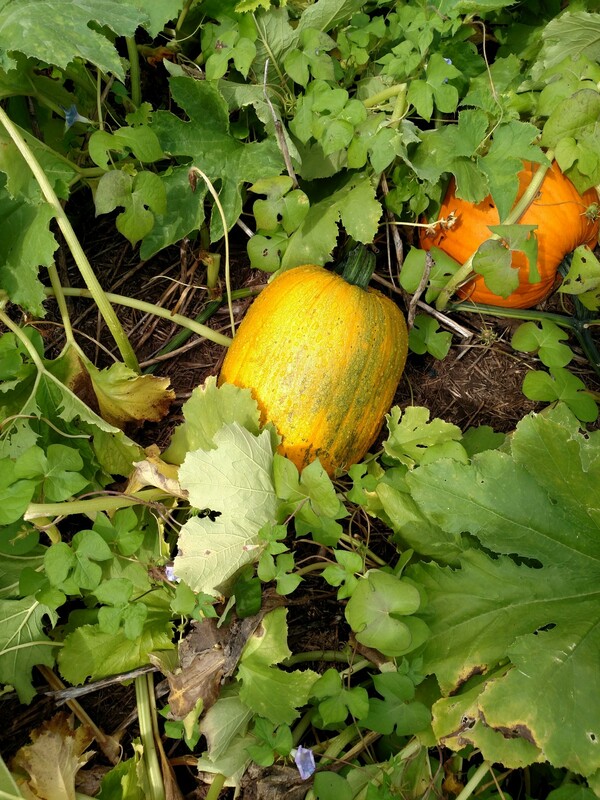 Estimate the crop yield – walk through the field and evaluate the yield of pumpkins that are ready to harvest. Be sure to only consider fruit of marketable quality. If the yield is at or above what is expected, it may be time to put the sprayer away. Estimate when harvest will take place – Pumpkins that are scheduled for harvest in the next week or two are less likely to need any fungicide treatment. A longer period to final harvest may indicate that there is time for immature fruit to ripen. For example, pumpkins that are to be picked by the consumer up to Halloween may have time to mature. Estimate the ratio of mature to green fruit – When growers scout fields to assess yield, it may be beneficial to also estimate fruit close to maturity. Growers should be realistic about how long it will take for green fruit to mature. Figure 1 shows two pumpkin fruit, one clearly orange and mature and the other green. It is impossible to estimate how long it will take the green fruit to properly mature. However, factors include weather, variety and health of vines. Warm weather, in general, favors ripening. For the most part, larger varieties will take longer to mature than smaller ones. Green, healthy vines tend to promote proper fruit maturity over yellow vines. Figure 1. It may not be cost effective to apply late season fungicides in order to get this green, immature pumpkin to ripen. Jack-o-lantern pumpkins are estimated to need 60 to 90 days to go from pollination to market maturity under warm growing conditions (see Table 11, Midwest Vegetable Production Guide mwveguide.org). Even when pumpkin fruit color change has taken place, fruit quality may be improved by leaving the fruit on the vine for another 10 to 20 days. Look again at the green fruit in Figure 1. The green fruit may be 2 to 4 weeks away from proper maturity. Additional fungicides applied to attempt to bring this fruit to maturity may be wasted depending on the estimated harvest date. See accompanying article in this issue about pumpkin fruit maturity. 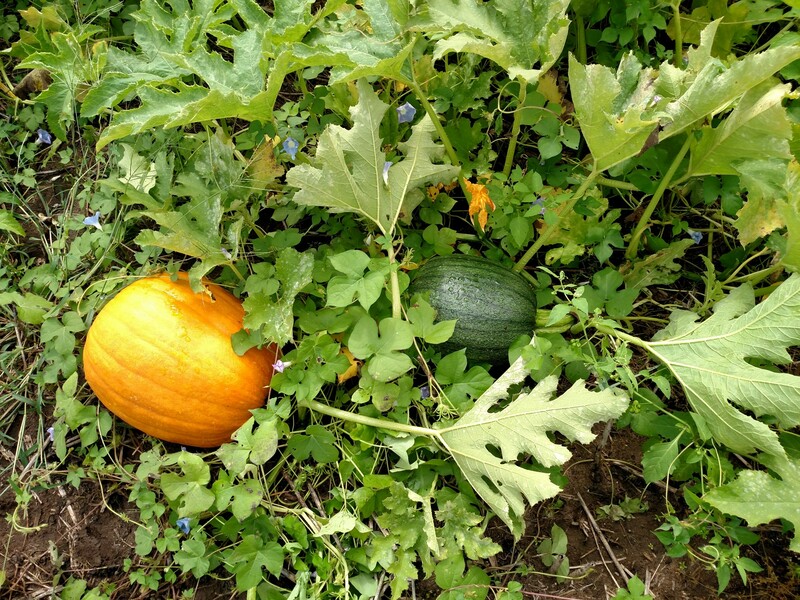 Figure 2, on the other hand, shows a mature orange pumpkin and another yellow one that sports a bit of green yet. The yellow pumpkin in figure 2 is more likely to mature properly in the next few weeks than the green pumpkin in figure one. Depending on circumstances, this fruit may benefit from additional disease management. Figure 2. The yellow pumpkin with a bit of green is more likely to ripen with additional late season management than the green pumpkin in Figure 1. Determine which diseases are present – Foliar diseases will vary in how much yield or fruit quality loss may be observed late in the season. Downy mildew affects leaves only. Fruit will be unaffected; fruit quality is unlikely to be affected by late season outbreaks. See article in this issue about downy mildew in Indiana. Perhaps a story will help to explain how we decide when to stop pumpkin disease management at the Southwest Purdue Ag Center (SWPAC). Downy mildew was observed last week in the pie pumpkin field at SWPAC where we invite school children the first week of October. The vines are in modest shape-some yellowing of older leaves is present in addition to the initial lesions of downy mildew that can now be seen. Powdery mildew is present, but is not severe. 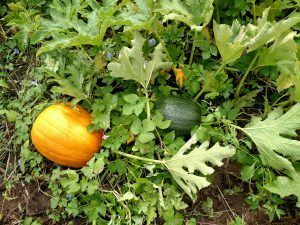 Dennis Nowaskie, SWPAC superintendent and I estimate that the crop is made; we have enough pumpkins for all the first graders that will visit. Therefore, Dennis and I have decided not to apply any more fungicides to this field. In fact, Dennis and I sometimes joke that a little downy mildew in Mid-September may prevent us from losing any first graders in the pumpkin foliage come October!